Martin has added to its ego collector range of DJ effects with the Martin ego 04. The first DMX controllable ego that projects razor sharp flower effect graphics and brilliant new gobo designs, adding uniqueness to your DJ light show. This highly individual 250-watt effect light houses a combined color/gobo wheel and features new radical gobo designs unlike any other effect light. Top quality projection optics combined with a precise manual focus adjustment produces extremely sharp, detailed projections. 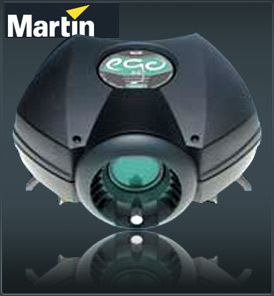 Besides the benefits of customized DMX control, the Martin ego 04 can operate in either auto or music trig mode. In trig mode variable behavior tuning allows DJs to adjust how aggressively the effect reacts to music. A remote control is also available and the Martin ego 04 comes with spectacular macros included for fast programming and demonstrations as standard. There is also a variable strobe effect with 0–100% digital dimming and variable effect speeds on both the parabolic reflector and the color/gobo wheel rotation which add to the DJ’s repertoire of effects. Like the other members of the ego family, the Martin ego 04 is both lightweight and highly portable with a rugged, composite design that looks great in any rig. A convenient handle and lens protection ring makes for easy transport and handling, and a switch mode power supply makes set up even more straightforward, meaning you can take your ego around the world. A special ego carrying bag is also available which will hold two fixtures. The DMX controllable Martin ego 04 is the perfect portable effect light for DJs and a good fit in clubs, bars and entertainment venues as well. The latest in a genuine DJ collector range, now there are even more possibilities to mix and match.